Take the load off IT by turning over the spool file management and report distribution to users generating the reports. 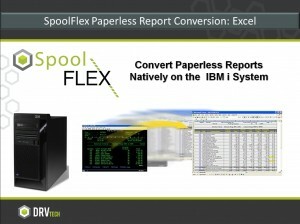 SpoolFlex easily transforms your IBM i, iSeries or AS400 spool files and reports into many popular PC file formats such as Excel (XLSX or XLS) without manually converting or re-keying information. Distribute by Email or post directly on your server for easy access by end users.